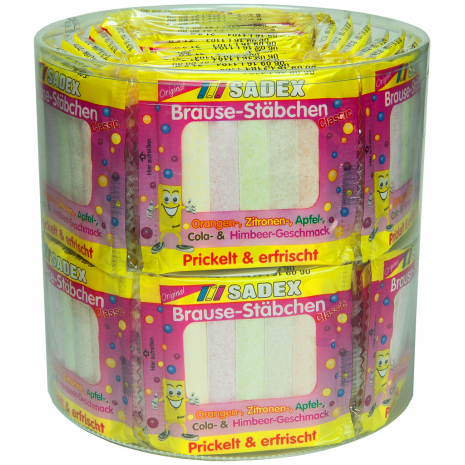 Enjoy this wonderfully fizzy fun with Sadex sherbet sticks. The fruit flavored sticks come in various flavors such as orange, lemon, apple, raspberry and cola for plenty of tangy and tongue tingling candy fun. Each tub contains 60 individually wrapped packages of 5 fizzing sherbet sticks. Enjoy this wonderfully fizzy fun with Sadex sherbet sticks. The fruit flavored sticks come in various flavors such as orange, lemon, apple, raspberry and cola for plenty of tangy and tongue tingling candy fun. With this round tub you are surely prepared for any party. Each tub contains 60 individually wrapped packages of 5 fizzing sherbet sticks. 1260g / 2.78 lbs NET. WT.